Changing one’s socioeconomic status can seem daunting. Add on top of that generational poverty and it can seem near impossible. So how do you get people to take on the challenge of doing the impossible? You inspire them, lift them up and show them a way out. Liza Romero, Caran Hartsfield and The Sonoran Initiative (TSI) are on a mission to do just that! 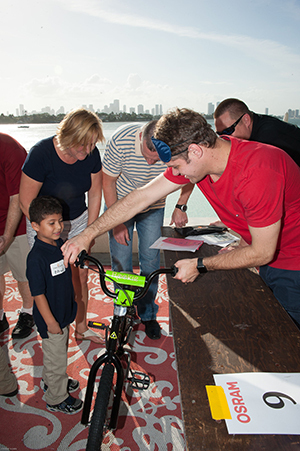 The yearlong program began in August with the launch of the Sonoran Initiative Immersion Weekend, taking place in Miami. 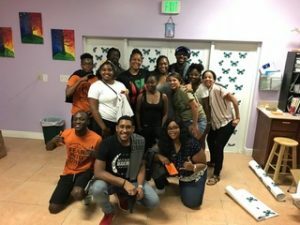 The group of young adults (Fellows) had a full weekend of activities to help them explore their beliefs, understand how past experiences have shaped their life thus far, and create a vision for their future. 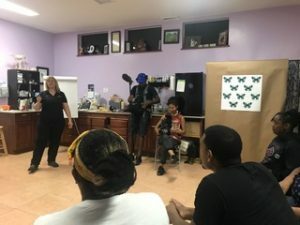 They experienced structured workshops in college preparation, financial literacy, personal narratives via therapist led exercises and the launch of their technology and art installation programs. The weekend ended with an opportunity to create a paradigm shift by participating in a Fire Power Seminars firewalk. TSI’s fire walk seminar began as they often do. Some Fellows shared they were excited, others were fearful and I can remember clearly one was ambivalent. I could tell by her body language that she had not bought in to the experience. I can still remember like it was yesterday when she said “I just don’t understand why we are here in this place, doing this thing“, with the corresponding attitude you might expect. I love to see this kind of reaction. Inside I chuckled because I knew what was about to happen for her. Within minutes she was cheering on others during the board breaking and then eventually standing in front of her peers to break through her own board with her bare hand. Ah – the process was starting to take shape! The firewalking itself was no less exciting. 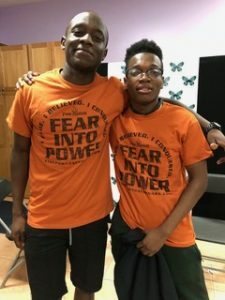 By this point the Fellows had identified self-limiting beliefs, learned about fear, how to overcome obstacles, how to walk on fire – ultimately how to turn their fear into power. They were now ready for their greatest challenge of the evening – walking barefoot across a bed of red-hot glowing embers. With each Fellow’s fire walk the excitement, sense of achievement and confidence became more palpable. I witnessed the most amazing post fire walk celebration from a young man named Wes. I think his yell could have been heard a mile away. It was so moving and visceral and will be ingrained in my memory forever. As for Wes and the rest of the TSI Fellows we are so honored to have worked with, we hope they feel the same about their firewalk experience. We look forward to hearing all about their future accomplishments. The Sonoran Initiative (TSI), is a nonprofit led by Liza Romero, founder and executive director and Caran Hartsfield, co-founder, vice president and also a film professor at New York University. TSI serves young people in underserved communities between the ages of 18-24. This age range is extremely vulnerable because most services (public, private and government programs) end for young people in the U.S. at the age of 18. There is a misconception that once a young person reaches the age of 18, miraculously they are somehow prepared for life; this is a fallacy. TSI’s goal is to help fill this gap, assess their Fellows’ talents, strengths and passions and provide them with education, critical resources, poverty-related trauma therapy, exposure to amazing experiences and the arts. It is how we permanently disrupt the cycle of generational poverty. Founded in 2006, Fire Power Seminars’ mission is to empower individuals, organizations and companies to achieve more than they ever thought possible. The company provides transformational experiences that are remembered for years to come through their experiential communication, empowerment, and team building programs that empower and inspire organizations and individuals to realize their full potential. For more information about Fire Power Seminars, call 954-232-4426 or send an email to Connie Phelan at Connie@FirePowerSeminars.com.